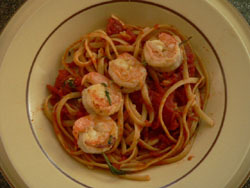 My shrimp recipe for Rosemary Garlic Shrimp can be prepared for an appetizer, main course or even add a skewer of shrimp to a nice steak for surf-n-turf. Combine oil, lemon juice, garlic, rosemary, salt and pepper. Add shrimp and marinate in refrigerator for 30 minutes. Toss occasionally. Saute in large skillet for 6-8 minutes over medium heat. A nice variation to cooking shrimp on the stove is to grill the shrimp on the bar-b-cue. 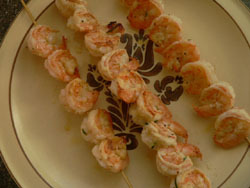 Skewers of grilled shrimp delicately flavored with rosemary and garlic are sure to please. If using wood skewers(which I recommend for this shrimp recipe), soak in water for 30 minutes while the shrimp are marinating. Or, use the stem of the rosemary for the skewer. I grow my herbs so I have plenty on hand to do this with. Preheat grill to medium high heat. 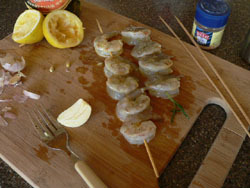 Place skewered shrimp on grill for 6 - 8 minutes, turning occasionally until shrimp is opaque and cooked through.